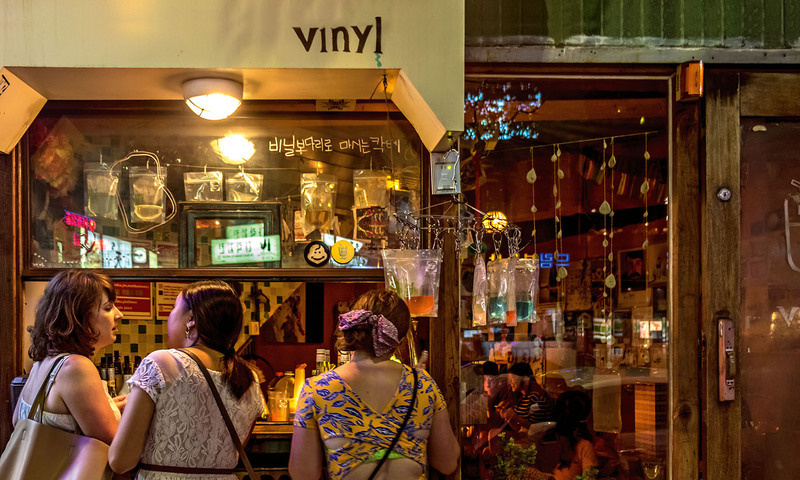 When you’re looking for indie music, craft beers and cool kids in the South Korean capital, there’s one neighbourhood that has it all. Dave Hazzan gets down in Hongdae. In Korea there are two big vices: work and play. At school and the office, Koreans will routinely put in 14-hour days for weeks at a time. So, in the little time they have free, they ‘play’ – a euphemism for going out and getting drunk with friends. With a population matching Australia's, Seoul and its suburbs teem with bars and restaurants. But it is Hongdae, in the northwest of the city, that really comes alive at the weekend. Artists, clubbers, ravers, craft-beer aficionados, students looking to hook up, office workers blowing off steam… On Friday and Saturday nights, they all pile into this neighbourhood near the university after which it’s named for the best time in town. Beer is king at Keg B. A recent boom in craft brewing in Korea means beer drinkers are no longer forced to drink the thin yellow piss most common in the country. Small and airy Keg B serves craft beers from Korea, Japan and the USA on tap, and dozens more bottled varieties from the fridge. Gaze from huge open windows on the third floor to the streets below, watching the beautiful young people shop, eat and drink. Blue and white decor gives it a Mediterranean feel, and it’s easy to while away a whole summer day here. Yeoltan bulgogi at Saemaul Sikdang. Barbecue is the crowning achievement of Korea’s national cuisine, and the Saemaul Sikdang chain is one of the best places to get your grill on. Waitresses bring great piles of pork and beef to your table – the yeoltan bulgogi (spicy thin pork) is sensational – then you cook it yourself over hot coals. Once it’s done, wrap it up with garlic, kimchi and ssamjang (thick, spicy sauce) in a lettuce leaf and chow down. Also highly recommended is the magnificent seven-minute kimchi jjigae, a spicy stew made of kimchi and pork, cooked over the barbecue grill for those aforementioned seven minutes and devoured with rice. Through it all, you can toss down glass after glass of cheap soju, a clear, vodka-like spirit Koreans throw back like water. Just don’t fill your own glass – no one pours for themselves at a Korean table, you philistine! Bag a drink at Vinyl. Think of all the reasons people are hooked by a certain bar: creative drinks, hot DJs, cool staff, somewhere to sit even during busy periods. Well, Vinyl distinguishes itself by serving cheap cocktails in plastic zip-lock bags with a straw. Legend! But even without the little bags, this bar, with its cosy, dim interior, Balearic music and pumpkin-coloured walls covered in gig posters, makes for a great stop on a night out. Plus, if it’s a little too crammed inside, there’s a take-away window where you can get your cocktails to go. Bar Da is a tiny gem. The road leading to Bar Da is an alley packed with thousands of fellow party-goers. As you’re being pushed through the masses, the entrance – just a small door with a tiny sign above – can be easy to miss. But climb the stairs and you enter one of Seoul’s most chilled-out and unique bars. There is a brilliant single malt scotch collection, sold by the bottle or glass, and each of them is great with a bowl of peanuts and dried anchovies. Swaddled in its dimly lit, 1920s charm, you can watch the mad alley beneath you. At Hongdae’s heart is a small park. During the day, children play here and artisans sell their wares in an open-air market. 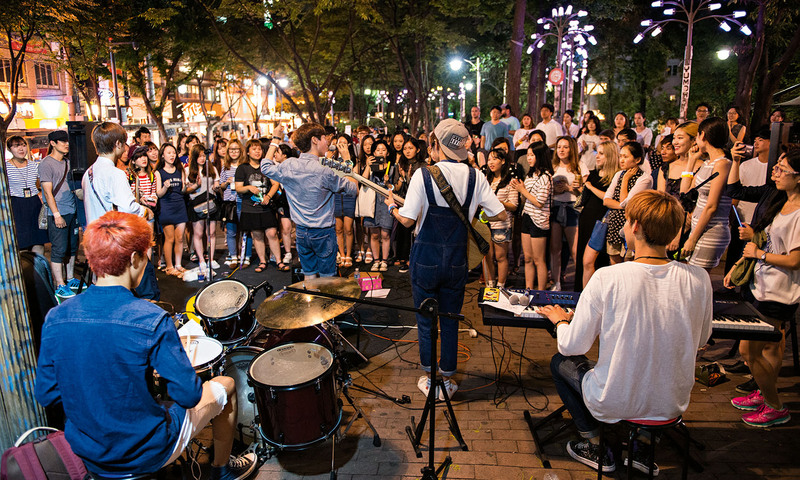 At night, however, it becomes ground zero for Korea’s buskers, including hip-hop acts, pop bands, punk groups and drum circles, all of whom bust out tunes while onlookers mix and flirt. The Goodtime 24 corner store across the street makes a mint flogging cans of beer to the parched, and cocktail vendors often set up stands. Just be sure to watch your belongings – purses have gone missing and, last time I was there, a homeless gentleman relieved me of my beer. 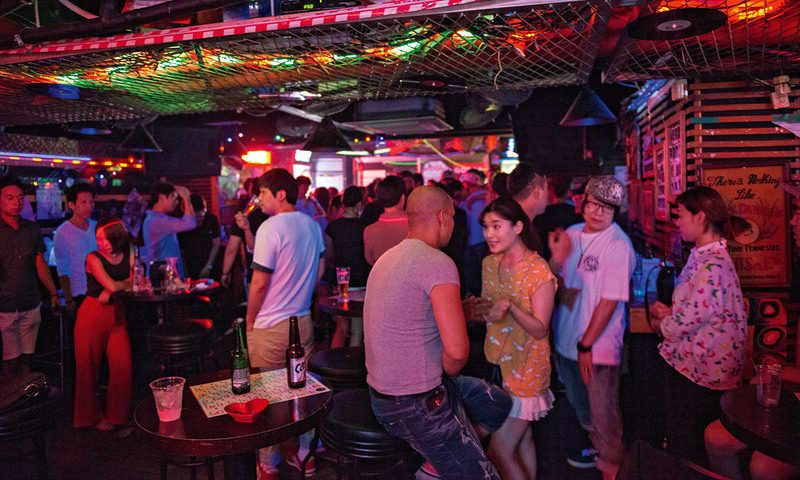 You’re going down; down into a basement to experience Hongdae’s thriving live music scene. Club FF (apparently that stands for Funky Funky) is one of Seoul’s best and most enduring venues, despite its shocking bathroom. For about AU$11, you can see acts like Wasted Johnny’s, a hard-driving blues rock trio whose singer-guitarist Angie rages like Jimi Hendrix in a miniskirt. You’ve arrived just in time for cocktail hour, too. From 11pm to midnight, rum and Cokes, screwdrivers and gin and tonics are all free. Yes, you read that right. Gogo’s is literally right upstairs from Club FF, accessed by a dodgy metal staircase in the front of the building. There is no cover charge, the drinks are cheap, and the indie pop music – think ‘Song 2’ by Blur – is loud. There is no official dance floor, so fun-loving youngsters dance between the tables, in front of the dartboards, and by the door – basically wherever there is free space to shake it. If you’re looking for Seoul’s most exciting, independent, underground techno club you’ve found it – well, almost. Vurt isn’t the easiest hot spot to locate – you will absolutely need the map on its website, since it’s way too hip for signage on the door – but the struggle is worth it for the rotating list of foreign and local DJs. Hand over your 20,000 won (about US$17) and descend into a cavern so dark and sinister-looking you might imagine blood could start spraying out the sprinkler system at any moment. It won’t (at least we don’t think it will), and the dark techno should get your feet moving. AirAsia flies from the Gold Coast, Perth, Melbourne and Sydney to Seoul’s Incheon Airport via Kuala Lumpur. House 740 is a beautiful guesthouse on a side street, only five minutes’ walk from Hongik University Station. There are 11 rooms in the establishment, and doubles begin at about US$60. You can chat in English with Kevin, the very friendly owner. If House 740 is booked solid, have no fear – Hongdae and its surrounding neighbourhoods have a huge range of affordable accommodation options. The Korea Tourism Organization (KTO) has plenty of info on what to do and see in South Korea. Whenever you run into trouble, get lost or just have a simple translation question, call its 24-hour, toll-free hotline at 1330. Press 2 for English.